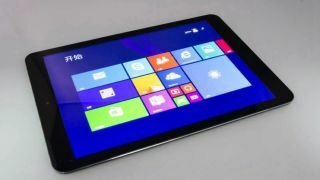 A Chinese company has become one of the first to start selling a tablet that dual-boots Windows and Android with the ability to switch almost effortlessly between the two. Liliputing posted a hands-on review of the Cube i6 Air 3G that tests how well the tablet performs with a pre-release version of Microsoft Windows 8.1, which will be upgraded to a full version when it eventually ships, and Google Android 4.4 KitKat. A dedicated OS Switch button, which is in the Quick Settings menu, allows you to switch between the two OSs, although the tablet must be rebooted if you want to change the OS that you're using. Dual booting devices would allow Microsoft to catch up with Android when it comes to the numbers game in the smartphone and tablet markets. The tablet itself features a 9.7in display with a 2,040 x 1,536 resolution, and under the hood there is an Intel Atom Z3635G Bay Trail chip, 2GB of RAM, 32GB of storage and an 8,000mAh battery. Connectivity-wise it has Wi-Fi, BlueTooth, 3G and a microSD slot, plus there are front and rear cameras. Huawei dual-boot on the way? Huawei is another Chinese firm that is apparently considering dual-boot tablets that run both Windows and Android with a possible announcement regarding this at MWC 2015 next month.